I’ve never really had a problem eating vegetables. In fact, I can’t think of a vegetable that I don’t like. I’m sure they are out there (durian fruit probably – but that’s a fruit! ), but I’m usually pretty happy with almost any vegetable dish. I’m not a normal eater really though. Most people have a problem with at least a few veggies and it seems like, to me, that most people have a problem with brussel sprouts! 1) Sprouts have some weird cultural stigmas and are frequently mentioned as the hard-to-eat veggie. 2) Most people have no earthly idea how to prepare them. So this is the brussel sprout recipe for people who don’t like brussel sprouts. Think of it as an intro to the sprout. Because what could be a better way to eat something than to put it on a pizza? 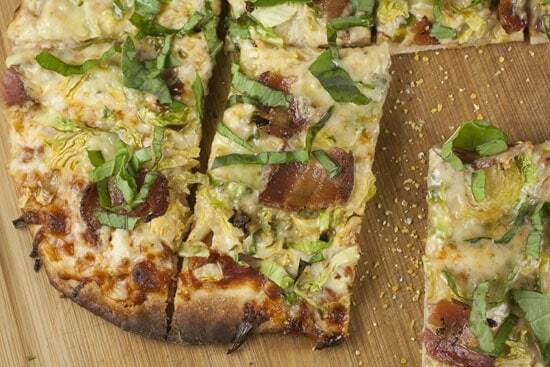 Homemade pizza topped with brussel sprouts, bacon, and blue cheese. Might sound strange, but trust me… it’s a keeper. 1) To make dough, combine water, oil, salt, and yeast in a mixing bowl. Stir together and let sit for 5 minutes to make sure yeast is active. It should bubble. 2) Stir in flour until it’s well-incorporated and forms a ball. Let it rest for 5 minutes. Then mix either with your hands or with a stand mixer. If using hands, repeatedly dip one hand in water and work the dough vigorously until it’s smooth, about 8 minutes. If using a mixer, mix with dough hook until smooth, about 6 minutes. If at any point, the dough is very sticky, mix in more flour. 3) Cut dough into 6 even pieces, coat with olive oil and add to a large plastic bag. Let rest for 20-30 minutes. 4) Refrigerate for at least 2 hours, but ideally overnight. 5) Remove from fridge at least 90 minutes before making pizza. 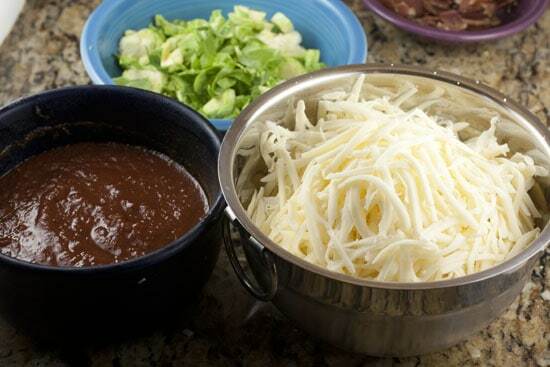 6) For sauce, mix together ingredients and set aside until needed. 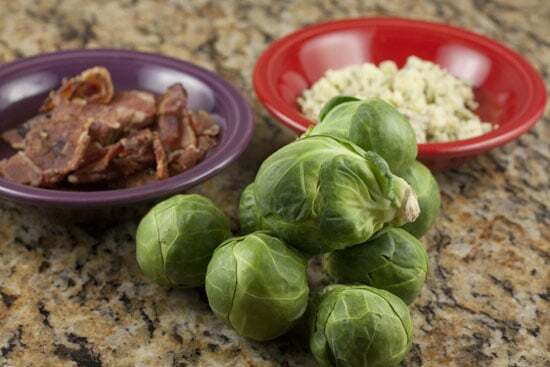 7) Grate cheese, cook bacon, and roughly chop sprouts. 8) Preheat oven to 550 degrees with pizza stone for at least 20 minutes. 9) Roll out dough to form a 12 inch pizza. Place dough on a pizza peel lightly dusted with cornmeal. Add sauce and spread it smoothly over pie. 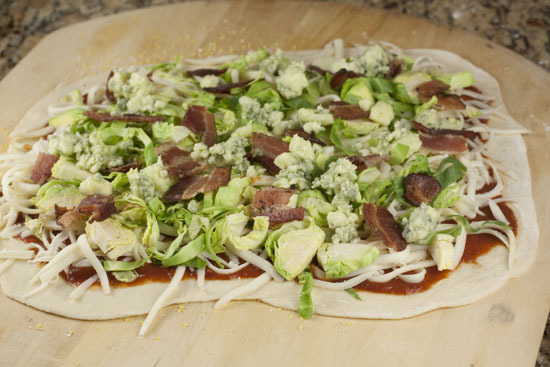 Top with mozzarella, sprouts, bacon, blue cheese. 10) Slide pizza onto stone and let cook for 10 minutes. 11) Take out pizza and top immediately with fresh basil. I’ve talked a lot about making homemade pizza dough, so I’m going to do the abbreviated version in this post. If you want a full run down, this post has a great run down on the method that I used for this dough. I really like making pizza dough. It’s actually one of the easier doughs to make in my opinion. It’s very wet so it’s actually pretty easy to work with once you get the hang of it. The key thing to remember about homemade dough is that you want to give it at least 4 hours to rise in the fridge (overnight is great) and then you want to take it out at least 90 minutes before baking your pizza. But there are a good number of store-bought doughs out there if you want to make this recipe even easier. There’s really only a few toppings for this pie, but each of them is packing a lot of flavor. 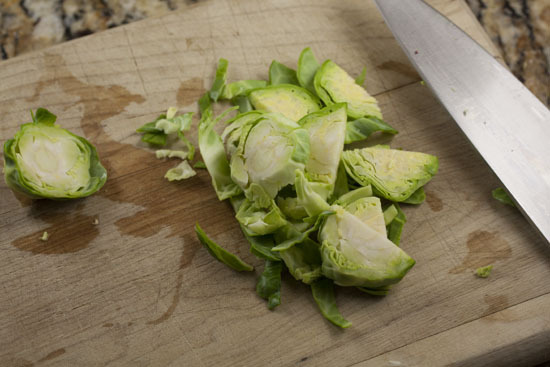 This a great beginner brussel sprout recipe because you don’t need to know how to prepare them perfectly. Basically just chop off the stem-end of the sprout and then dice up the sprouts. I sliced each sprout in half and then just sliced the sprouts roughly. 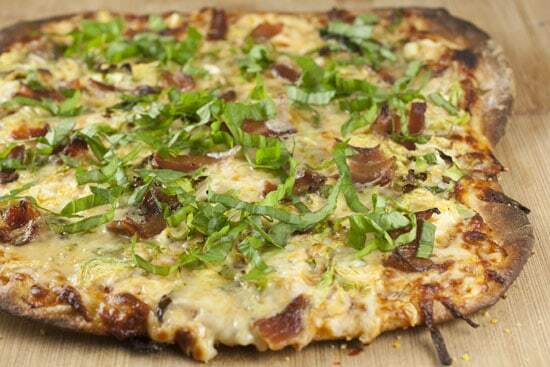 Besides the bacon, sprouts, and blue cheese, you need a good sauce and mozzarella as well. One thing I’m not a fan of is most store-bought sauces. Similar to my homemade trial with pasta sauce, pizza sauce tends to be pretty flavorless and too salty. So take the time to stir a few spices into normal tomato sauce. You don’t need to cook it or anything. You’ll end up with a much better sauce. Trust me. Assuming you have a pizza peel and stone, making homemade pizza becomes pretty straightforward. Just make sure you heat your stone up as much as you can. I crank my oven up to 550 and let it preheat with the stone in the oven for at least 20 minutes. Meanwhile, roll out your dough into a rough circle. Mine usually ends up slightly more rectangle in shape, but whatever. 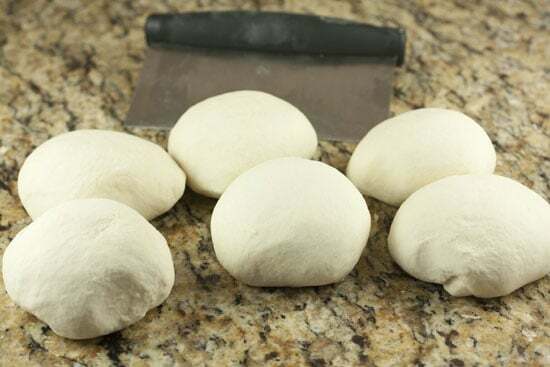 If you use the homemade dough recipe in this post, you should get about a 12 inch pizza out of each dough ball. 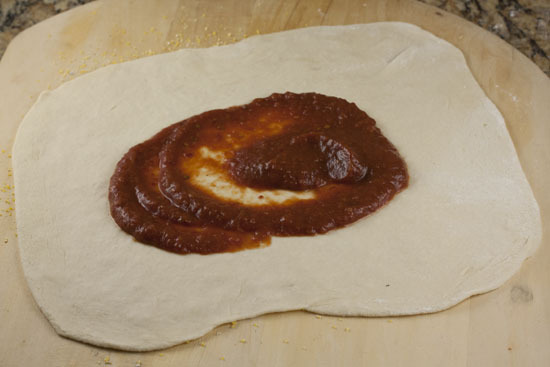 Than transfer the dough to your pizza peel that’s been dusted with cornmeal and ladle on a bit of sauce. I don’t like a lot of sauce on my pizzas. About half a cup per pizza is usually enough for me. Spread out the sauce, then top with mozzarella cheese. 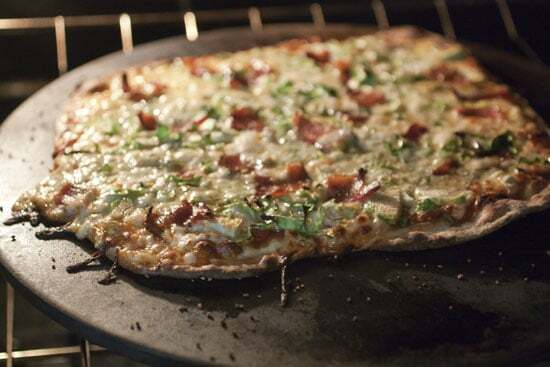 Follow that with your bacon, sprouts, and blue cheese layers. Slide the pizza right onto your hot stone and let it cook for about 10 minutes. The crust should get nice and crispy and the cheese should be bubbling hot. I snuck a peek at mine at about minute nine. When you pull the pizza out, immediately top it with some fresh basil. You wouldn’t want to bake the pizza with the basil on it because it would just shrivel up and lose a lot of flavor. Fresh is best when it comes to basil. Let the pizza cool for a minute or so and then slice it up! I usually judge most pizzas by crust alone, but I have to say that toppings on this guy surprised me. They were really flavorful. 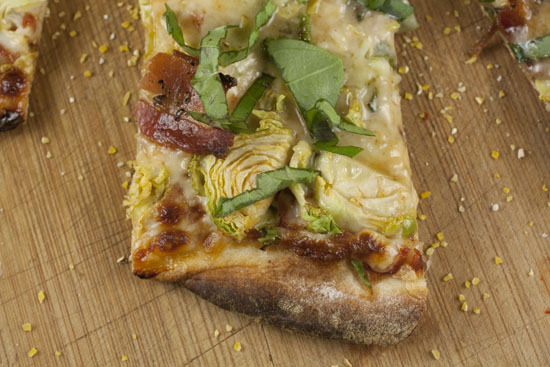 The brussel sprouts just give a light veggie flavor to the pizza. It’s really not an intense flavor and I think most people would like it. Homemade pizza is one of my absolute favorite things to make and this recipe is a keeper for me.